Rail passengers in Cumbria and southern Scotland are facing another weekend of disruption with station closures and strike action. Virgin Trains is advising passengers not to travel on the East Coast today or tomorrow because of the bad weather. The West Coast main line between Carlisle and Scotland remains closed with no trains or replacement buses. Due to extreme weather conditions on our east coast route, we are advising customers not to travel today or tomorrow. We’re working hard to look after our customers in whatever way we can and customers who have booked to travel will be able to use their tickets next week." Passengers travelling across both the east coast and west coast routes are advised to check their journey online before travelling. Rail passengers travelling north today are warned to expect delays because of a line side fire near Wembley. All services between Milton Keynes Central and London Euston are shut for repairs until early afternoon. Rail passengers are experiencing delays of up to 25 minutes on journeys between Carlisle and Lancaster this morning. Virgin Trains and TransPennine Express are having to run at reduced speeds on the line between Oxenholme Lake District and Penrith North Lakes. Disruption is expected until 12pm today. There are major delays to trains arriving and departing Carlisle station due to signalling problems between Glasgow and Lockerbie. Virgin trains say they have requested coaches to replace services. #VTUPDATE Cross ticket acceptance in place with @tpeassist. Coaches have also been requested at Glasgow and Carlisle. A train is being re-named at Carlisle station today in recognition of the resilience shown by the people of Cumbria during the recent floods. 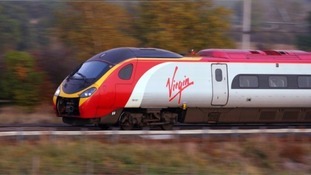 Virgin Trains will unveil the Pendolino train, which has been re-named "The Cumbrian Spirit." A train company is offering discounted fares to parts of northern England hit by flooding, in a bid to boost tourism. People travelling between London and Scotland, via Cumbria, can now get automatic refunds for trips that are delayed for 30 minutes. Stretches of the the West Coast main line will be closed for four days over Easter, leading to delays of up to two hours on journeys between Glasgow and London. Virgin Trains are advising Scots to go to Edinburgh and use the East Coast main line to London as major engineering works take place. The trip is expected to take around six hours instead of the normal journey time of four hours and 32 minutes because of the diversions . Virgin Trains are also warning passengers of overcrowding over the Easter weekend.